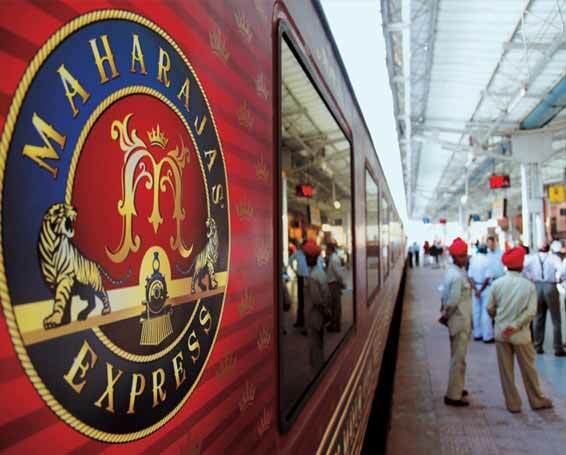 Maharajas Express Gems of India Tour, 3N/4Days Maharajas Express Luxury Train Tour . The Gems of India aboard the Maharajas Express Train is an itinerary discovering the heritage of golden triangle of India. But the difference here lies in the way how this golden route to glory is explored. 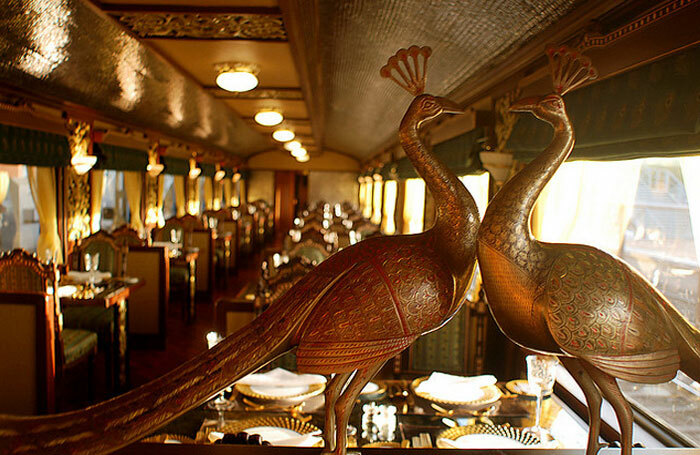 The journey takes place aboard the Maharajas' Express, a luxury train which redefined the royalty of erstwhile India in modern times. 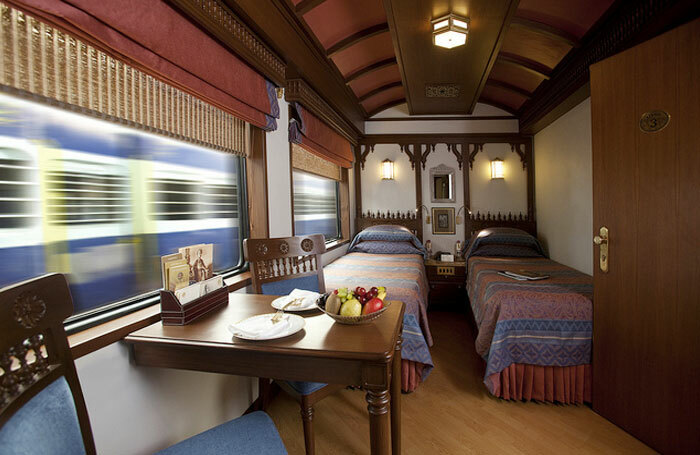 The train is not just any other medium used for travelling, but is a grand interpretation of India's golden age traversing through Delhi, Agra and Jaipur. Draped in rich maroon hues with a hint of gold and royal blue, this premium train is greatly known for its precious experiences. 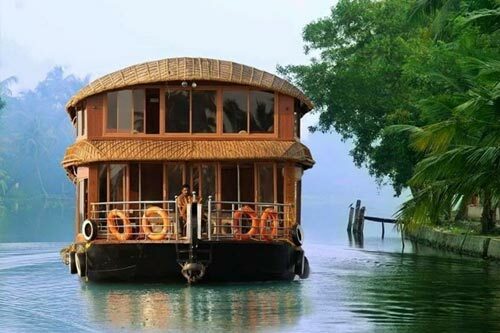 Every moment onboard this three day itinerary is a prized celebration of gems in India. 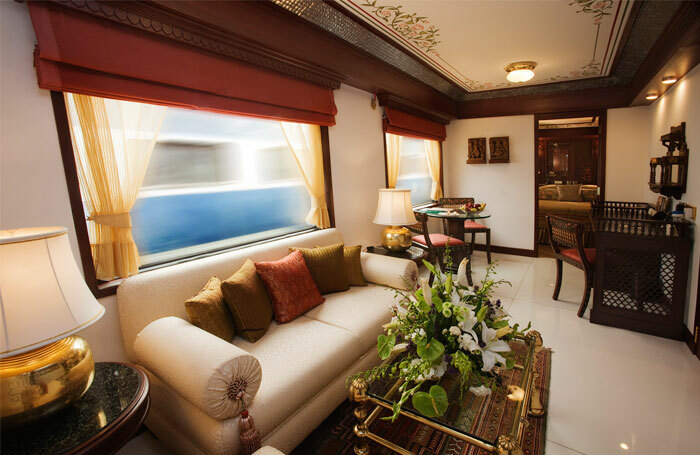 The train coupes are named on and inspired by the 15 most precious gems of India, which in turn offer an experience extraordinaire. Each coupe draws the theme and colour coordination based on the gems on which it is named. The two in house restaurants, Mayur Mahal and Rang Mahal serve the varying taste buds with an enthusiastic zeal. 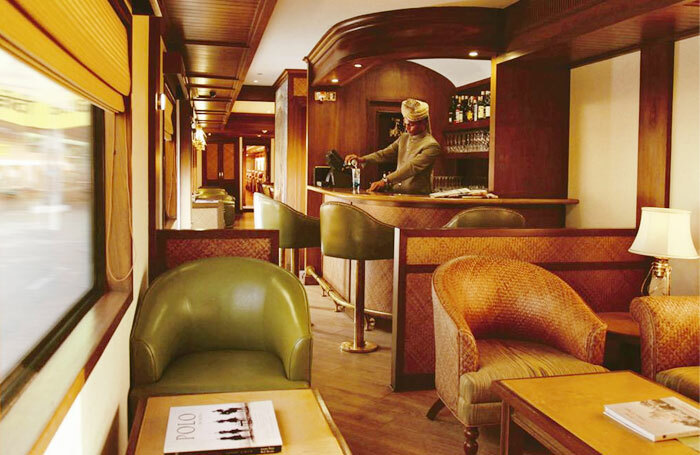 To add on to the pleasures and uplift the spirits, the train is bedecked with the choicest variety of wines, beers, and spirits. 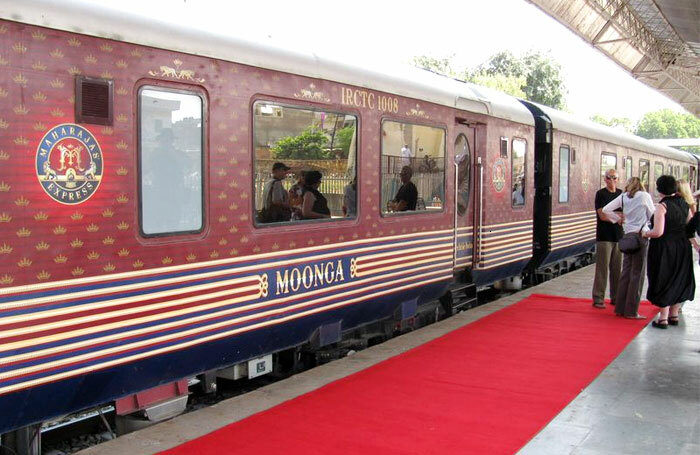 All this is just said about the glory of this grand luxury train. 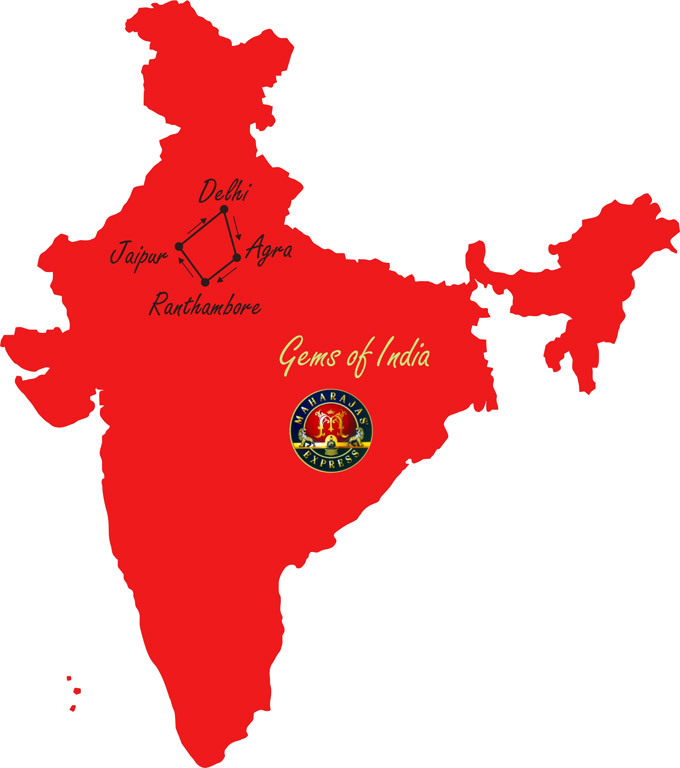 The route on which this Maharajas' Express train trails is also a triangle bestowed with the illustrious gems of India. 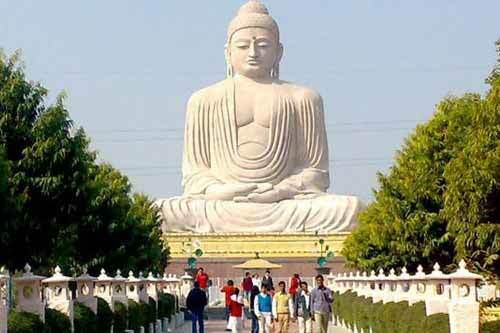 The tour begins from the city ingrained with difference in terms of culture, flavours and ethnicity, Delhi and transfers passengers on the most luxurious trail to Agra, the city of Mughal essence and character. There awaits the Maharajas' one of the most royal experiences of marvelling at the architectural jewel of India, Taj Mahal and enjoying champagne dinner in the morning. Later, passengers will be transported to the capital of the royals, Jaipur. Dotted with the forts, palaces and monuments, this city is a great experience of touring the Maharaja way. Welcome on a fulfilling journey where moments go through like gems that remain etched in the memories forever. By 20:30 hrs, assemble at Safdarjung Railway Station in Delhi where the king size transportation is ready to transport you to the kingdoms of Maharajas in India. You will be welcomed amidst the celebratory cacophony of music, dance and Indian traditions. The first greeting at the station featuring traditional Indian welcome of Aarti and Red Tilak makes every passenger a part of lively India. 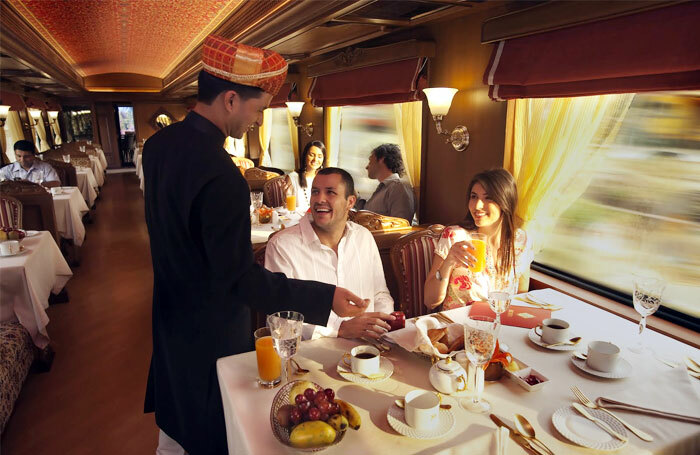 After the check-in formality is over, board the majestic Maharaja Express train, occupy your plush coupes and enjoy dining inside the intricately decorated royal restaurants. Leave Delhi for Agra around 22:00 hrs. Overnight on the Maharajas' Express. Highlights of Day 1 - Be in majestic awe as you board the Maharajas Express – Gems of India in royal flamboyance and exhilarating reception. Arrive into the city of love, Agra where the indomitable spirit is inherently present in the form of Taj Mahal, the monument of love. Besides Taj Mahal, the city is famous for its celebrated legacy of handicrafts, featuring marble and soft stone inlay work. 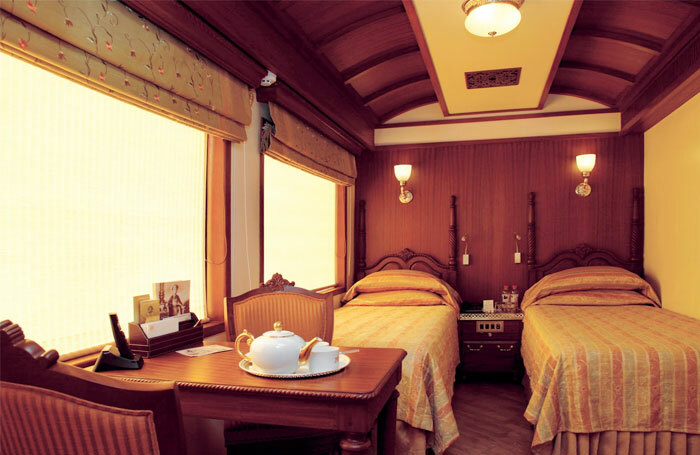 Early morning, deboard the Maharajas’ Express Train for living the priceless moments at Taj Mahal. 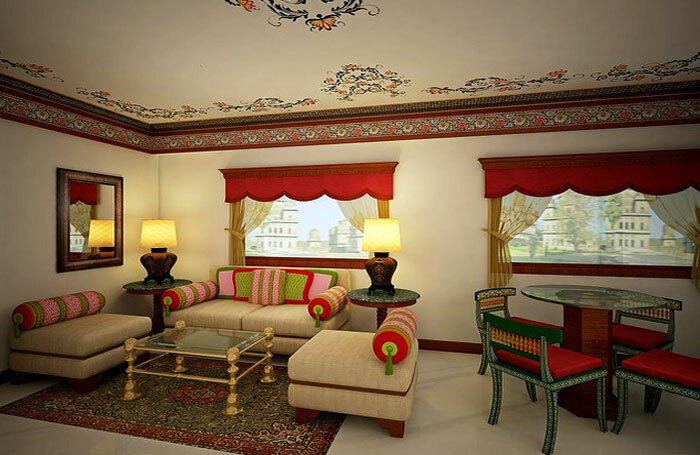 The white legacy, draped in the nascent sunny hues presents a breathtaking view of this splendid edifice. The illustrious visit is accentuated with a Champagne breakfast atop Taj Khema gazing the marvel in marble, Taj Mahal. After such an exhilarated start of the day, there are options to plan the day. You can return back to relax in the train. Or can explore the rich city of Agra in great detail through an optional tour to Fatehpur Sikri or Itmad-ud-Daulah. After lunch onboard, proceed towards the magnificent Agra fort, another world heritage site in the city. This mighty towers and facades of this walled city present a monument testifying the glory of flourishing Mughal Empire. Also known as Lal Quilla, Fort Rouge or Quila-i-Akbari, this monument is the highlight of the Agra city, the then capital of Mughal Sultanate. 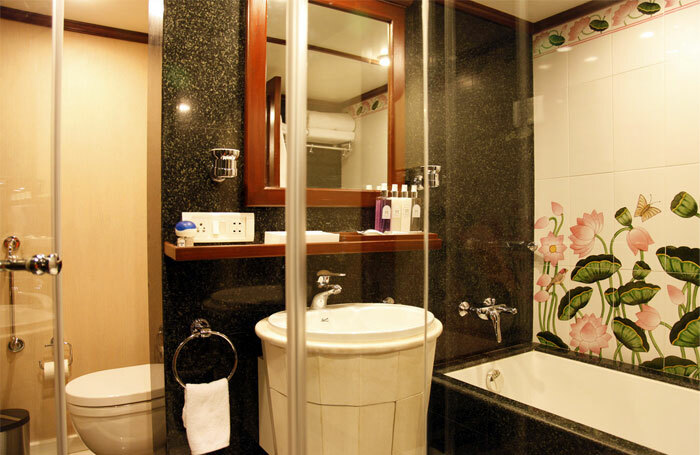 Also, there is another option in Agra where you can avail Spa facilities at a five star hotel or explore the bustling bazaars of the city through a private shopping tour. 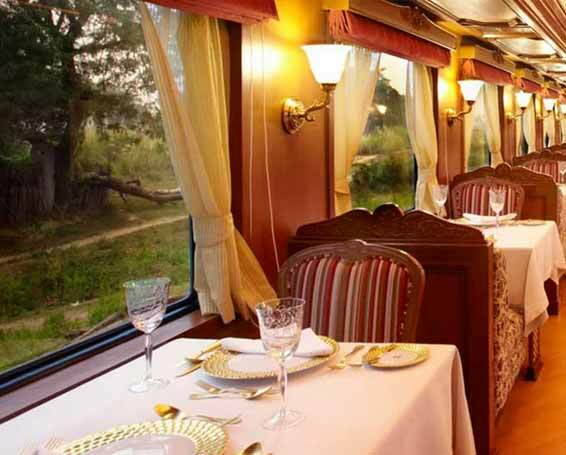 In the evening, return to the comforts of the train and venture towards Ranthambore, the next enroute destination. Lunch and Dinner on board. Overnight on the Maharajas' Express. Highlights of Day 2 - Relish the Champagne Breakfast at Taj Khema while gazing at the brilliant beauty of Taj. On early morning arrival in Sawai Madhopur, get ready for venturing out to the Ranthambore National Park. The semi arid forest of Ranthambore was the private hunting ground of the Maharajas. 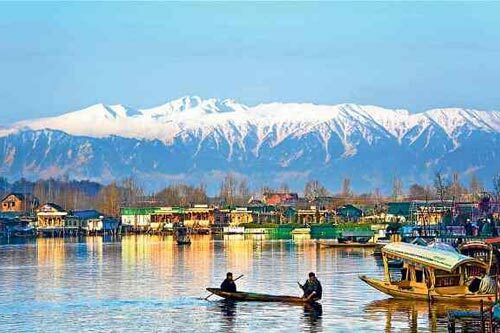 It is now a protected National Park, synonymously called as flourishing den of tigers. Besides tigers, the park is also a home to sambar, chinkara, chital, wild boar, nilgai, sloth bear, hyena, jackal and leopards. Complete this exciting game drive by spotting the elusive tiger or leopards. Post this safari, leave for breakfast at Vivanta by Taj at Sawai Madhopur and later return to the train and continue the journey to the Pink City – Jaipur. Jaipur, the capital of Rajasthan is a city known for its indulgent palaces, forts and temples. Upon arrival in Jaipur, enjoy the lunch and later disembark to visit the Amber Fort, the dream-like walled fort mansion of the city. Later, enjoy shopping artifacts and you will have the opportunity to shop for some of the finest traditional jewellery, textiles and blue pottery for which the city is known worldwide. 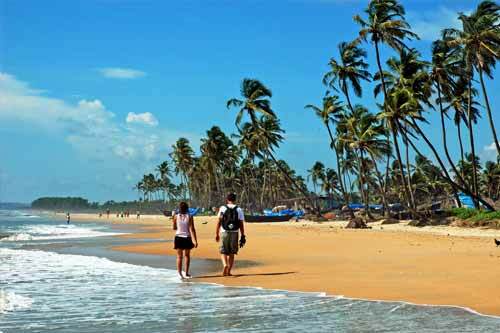 Following lunch, you may choose the option from a variety of optional tours suiting your needs. Enjoy spa facilities at a palace hotel OR proceed on a private shopping tour OR enjoy Golfing at the Rambagh Golf Club OR visit to City Palace and Jantar Mantar (The Observatory) are few of the options in Jaipur. If you think, you are going to miss the ride of the royals – the mighty elephant, then one of the most awaited moments of the journey are waiting for you at Exhibition Elephant Polo Match. Enthralling Exhibition Elephant Polo Match at Jai Mahal Palace Hotel. You can even participate in the royal game by sitting on the elephant’s back as a part of a regal parade. Upon arrival at the Palace Hotel, experience the royal welcome by the royal military band and the beating of ‘Nagadas’. Enjoy the Farewell Champagne Dinner at Jai Mahal Palace Hotel. Following dinner, return to the station and board the train for your onward journey towards Delhi. Overnight on the Maharajas' Express. Highlights of Day 3- Game Safari at Ranthambore and Exhibition Elephant Polo Match at the Jai Mahal Palace Hotel Grounds followed by Champagne Dinner in Jaipur. Breakfast onboard as you arrive into Delhi. 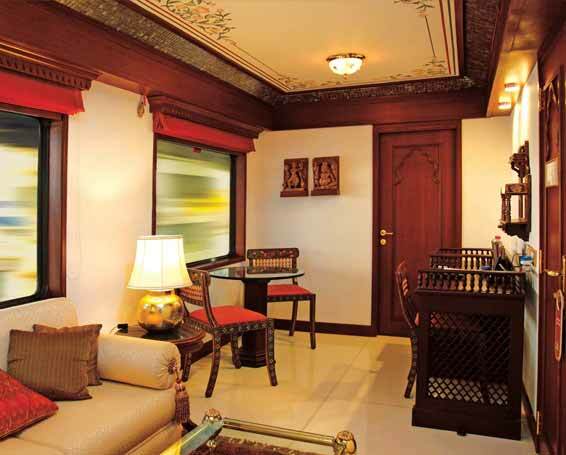 Bid farewell to the Maharajas’ Express - Gems of India with the journey extraordinaire. Note: - All 'Options' / 'Optional Tours' are on chargeable basis and are subject to availability. Details and pricing will be made available on board during the journey. Relish the Champagne Breakfast at Taj Khema while gazing at the brilliant beauty of Taj. Participate in the Game Safari at Ranthambore and Exhibition Elephant Polo Match followed by Champagne Dinner in Jaipur. Explore the gorgeous golden triangle of India in gilded flamboyance on this Gems of India – Maharajas’ Express Train Tour. 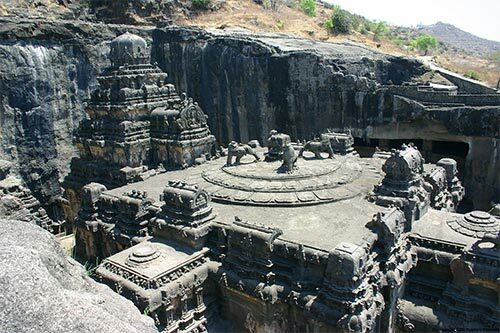 This premium journey trails around the centers of power and architectural splendours India is known for. Take a tour to the timeless Taj Mahal and royal forts and palaces of Rajasthan in style and extravagance on this worthy journey of life in India. 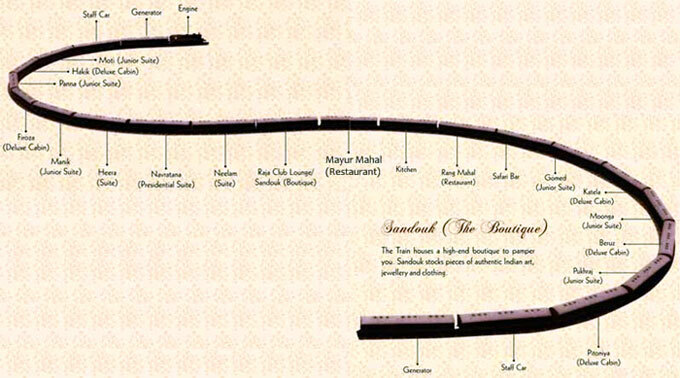 Follow the schedule to book your date with Gems of India – Maharajas’ Express Train Tour. Discover the secrets of Golden Triangle in absolute flamboyance as you board the mighty Maharajas’ Express Train. Draped in the colours of royalty and luxury, the journey will take you through the royal trinity of India featuring Delhi, Agra and Jaipur. Explore the gems of architectural and historical splendour in the golden route to India.